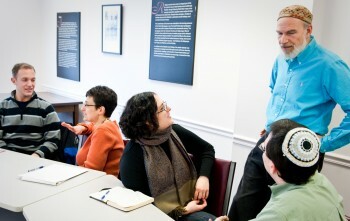 Through their Gendler Grapevine Project initiative, the Reconstructionist Rabbinical College (RRC) is developing and will offer the course, “Rabbis as Activist Leaders for Environmental Sustainability and Justice.” The course will be taught in the spring semester, beginning in February 2015. The course will combine text, experiential exercises and activist involvement. It will cover fundamental teachings on Judaism and the environment, a deepening of the rabbinical students’ personal connection to the earth, and the basics of non-violent direct action. The course will examine current environmental issues, such as climate change and shmita, and how rabbis can address these issues both as rabbinical leaders and as activists. Rabbi Liebling is also consulting Christian ethicists who work on issues of non-violence and will incorporate their suggestions into the curriculum. The lasting impact of this Gendler Grapevine Project is significant. The course will become a permanent course at RRC, and the curriculum may be adapted for use in adult education settings, particularly college campuses and congregations. The curriculum will also be available to over 400 Reconstructionist rabbis and rabbinical students as well as to over 100 affiliated congregations via Reconstructionist websites. In addition, the curriculum will be shared through the Gendler Grapevine Project website.